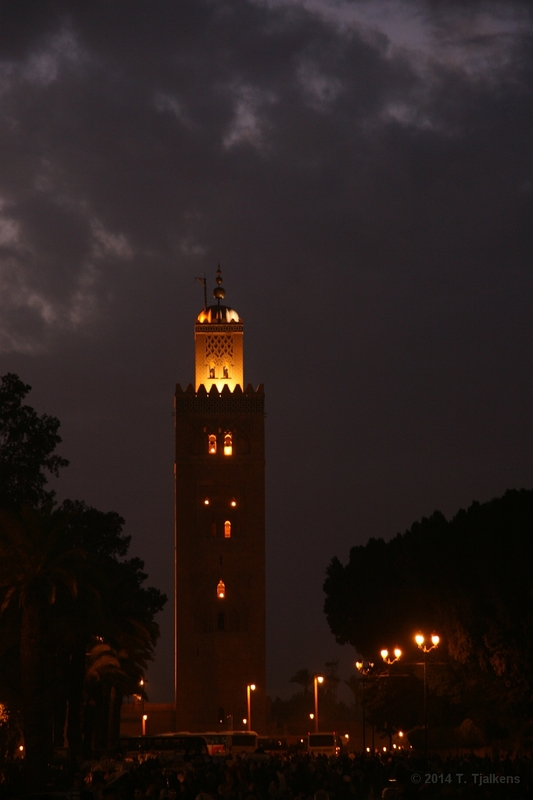 1 This is the Koutoubia Mosque, which dominates the skyline of Marrakech. 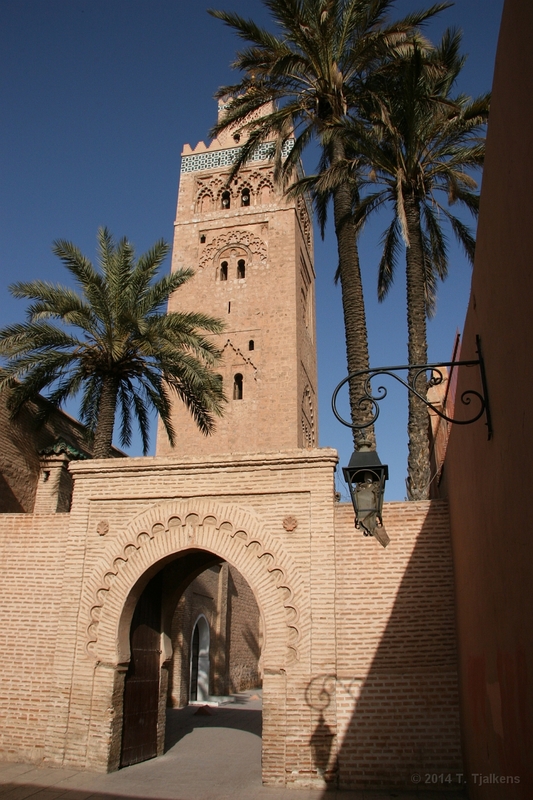 Marrakech's tallest building dates from the 12th century and is the prototype for Moroccan design, with each facade and archway on the square minaret carved with a different architectural flourish. 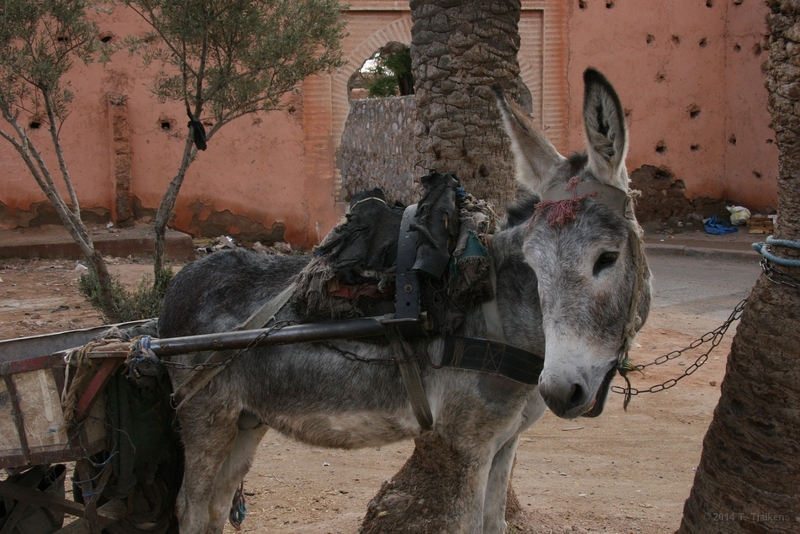 2 Donkeys are often seen in Marrakech, they are used for transportation of goods and people. 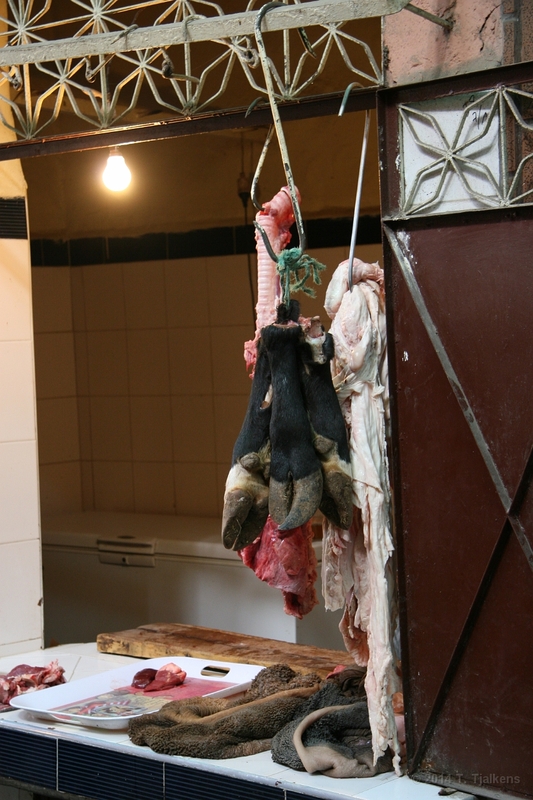 3 The local butcher sells cow legs, not sure what to do with it. On the desk are two sheep stomachs. Also not my favourit dish. Same for the piece of throath behind the legs. 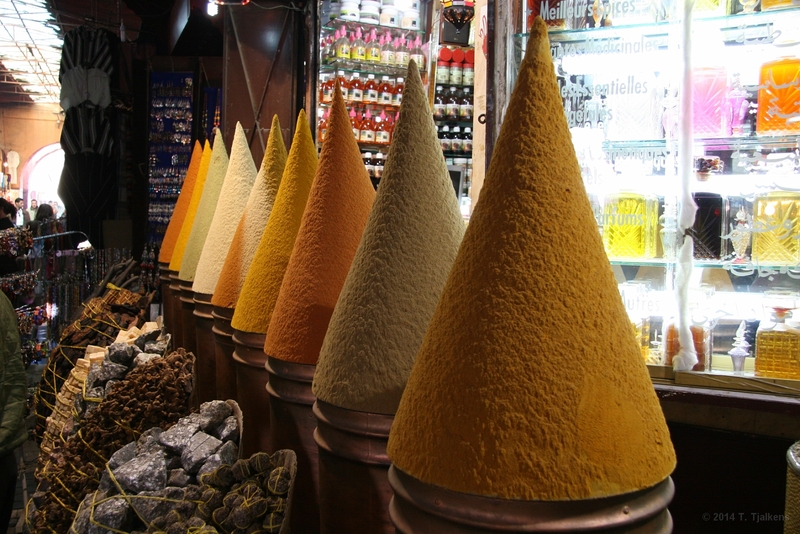 4 In the souks you can buy all kind of spices, often beautifull sculped like this. 5 I liked this photo because of the dark blue colors. 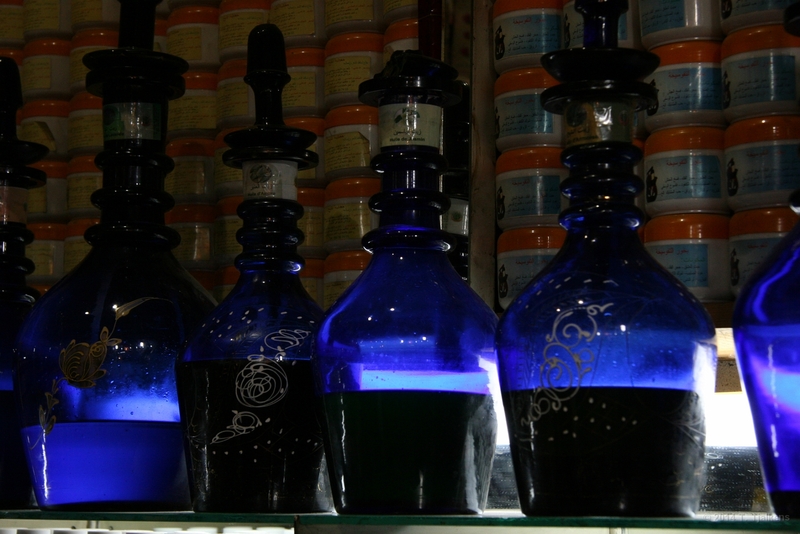 The bottles are also standing in a spiceshop in the souks. 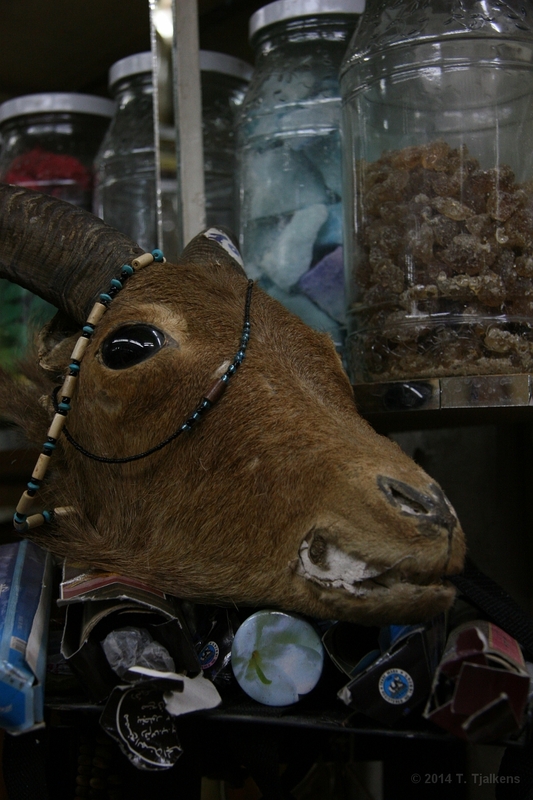 6 This is in a small shop where they sell medicine and also do some massage. There are some strange things laying around like this stuffed head of a cow. 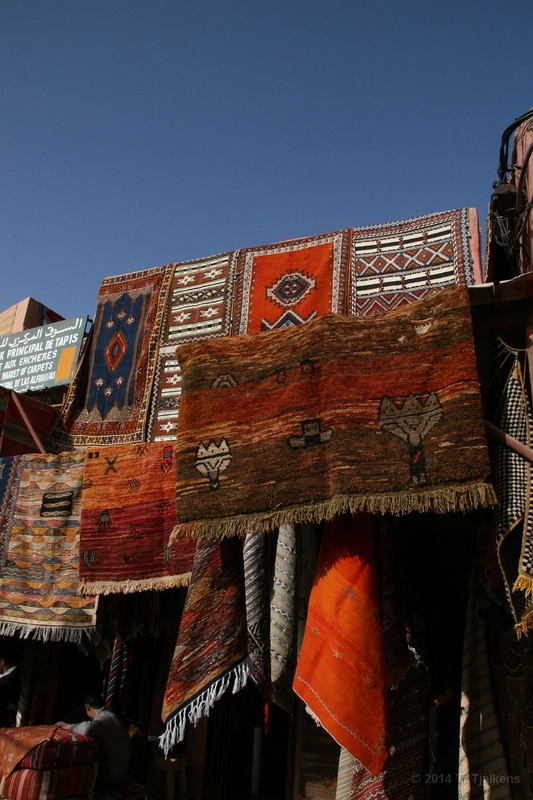 7 The carpenters souk, beautifull colors and beautifull carpets. 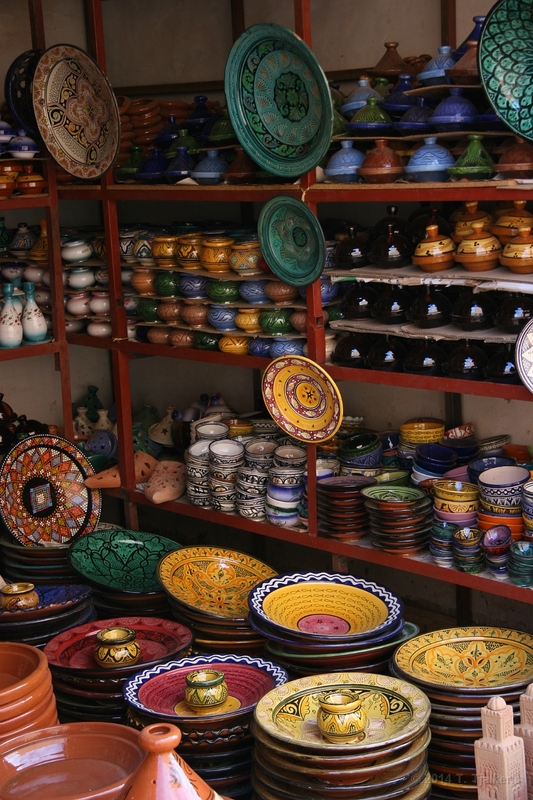 8 Also the carpenters souk, they also sell hand made baskets and small tourist items. 9 The Koutoubia Mosque at night, seen from the Jemaa el Fna (Place of the Dead). 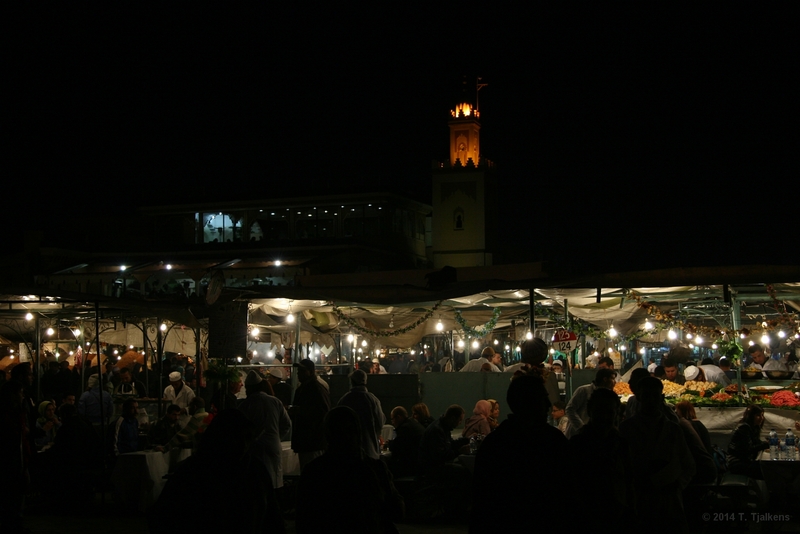 10 Jemaa el Fna at night, locals and brave tourists buy and eat food and fruits here. 11 Another donkey near the city walls. 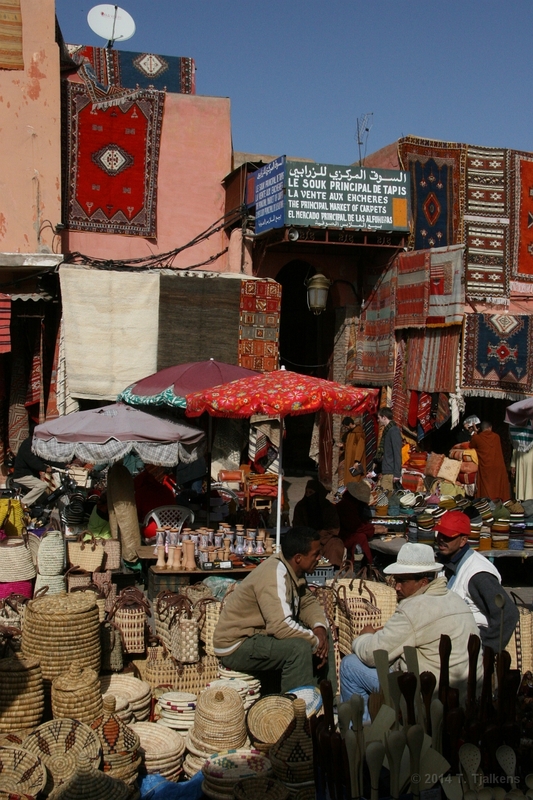 12 This is a little outside Marrakech, no tourists around, prices are cheaper and the quality is better. 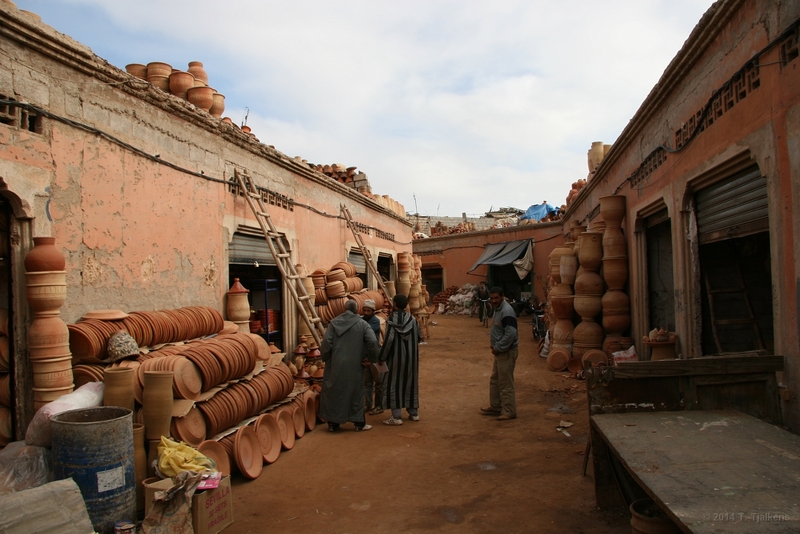 13 On of the small stores with typical Moroc pottery. This is good quality, you can use it every day if you want. 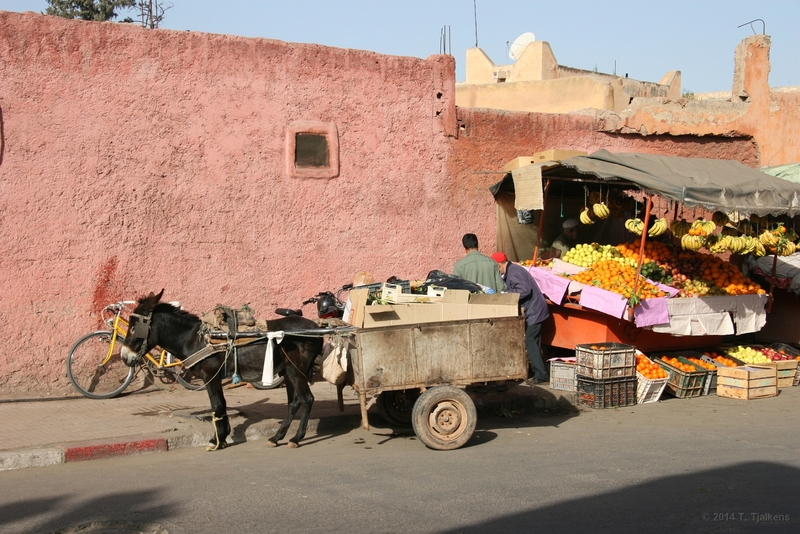 14 The tanneries to the northeast of the souks. 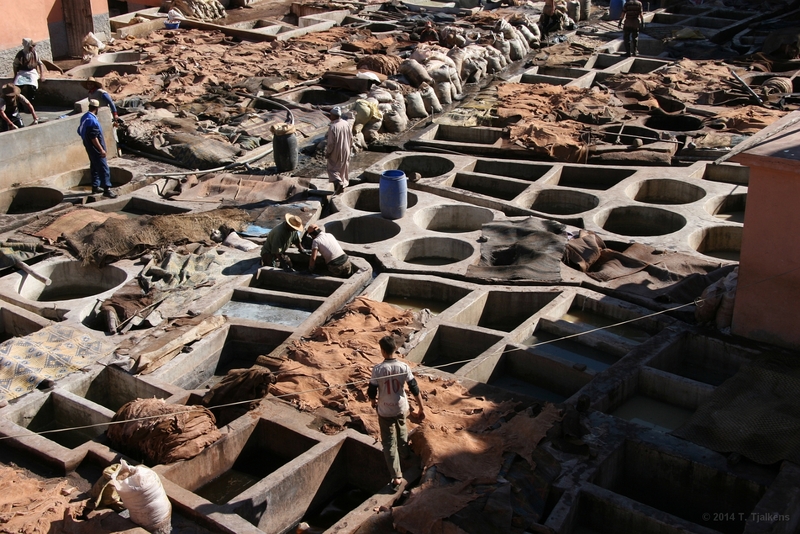 The local leather-tanning setup involves toxic chemical dyes and an unholy stench, if you don't like that then please avoid it. But on the other hand, in the nearby shops you buy leather items for almost nothing. 15 The Medersa Ben Youssef is a Koranic school that dates from the 16th century. It's beautifull decorated in Islamic style. 16 The great square of Jemaa el Fna is the centre of medina life both day and night as a gathering place and unofficial stage for street theatre. 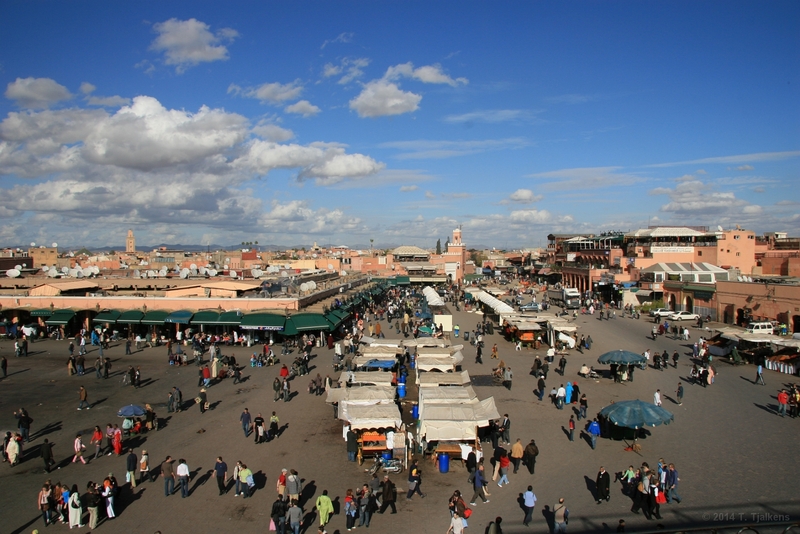 For over a millennium, the Jemaa el Fna's daily bill has featured acrobats, henna tattoo artists, storytellers, belly dancers, musicians, snake charmers, and potion sellers. 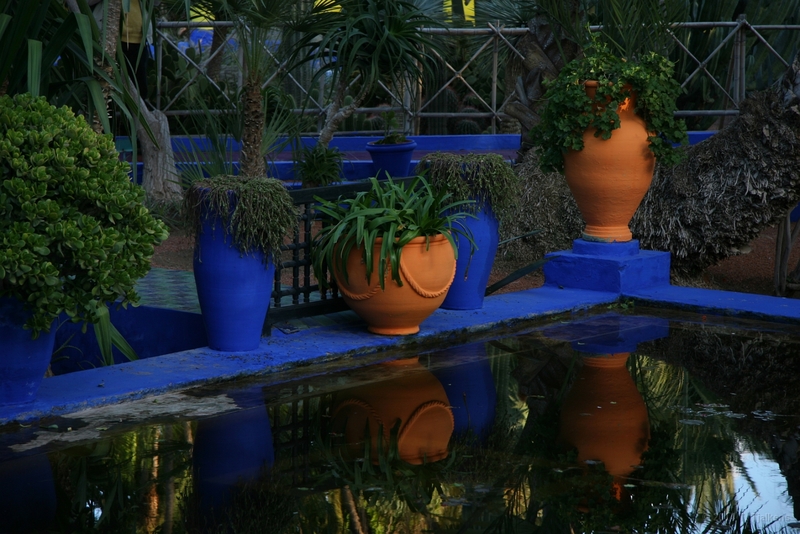 17 Given by the fashion designer Yves Saint Laurent as a gift to the city of Marrakech, this botanical garden was created in the 1920s by French artists Jacques and Louis Majorelle. 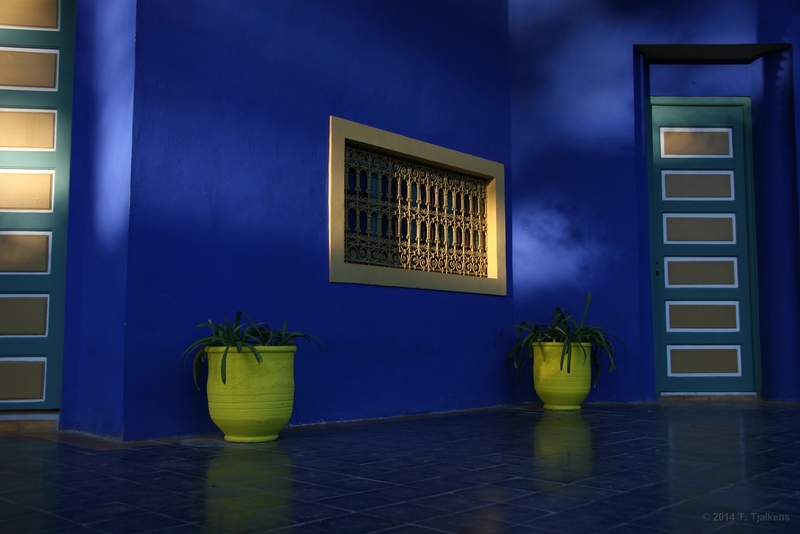 18 Perfectly manicured gardens, with pools, giant cacti, bamboo, coconut and banana trees, stand out against the bright-blue wash that covers the villa and garden walls, with splashes of lemon yellow and emerald green on planters, doors, and furnishings. 19 Really amazing how they combined all this colors to get a perfect result. 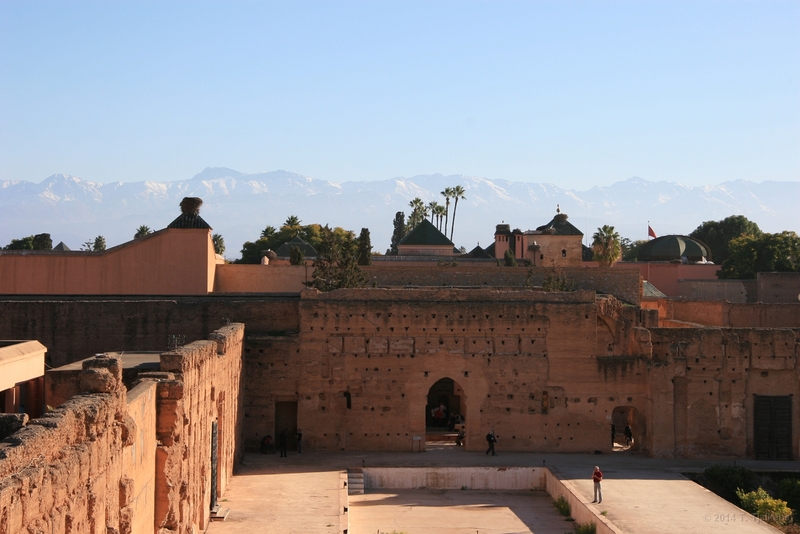 20 This once magnificent palace, whose name means the 'incomparable', was built in 1578 by the Midas of Marrakech, Sa'adian sultan Ahmed el-Mansour. In the distance you can see the Atlas mountains with snow on it. At this moment it was 35 degrees Celsius in Marrakech. 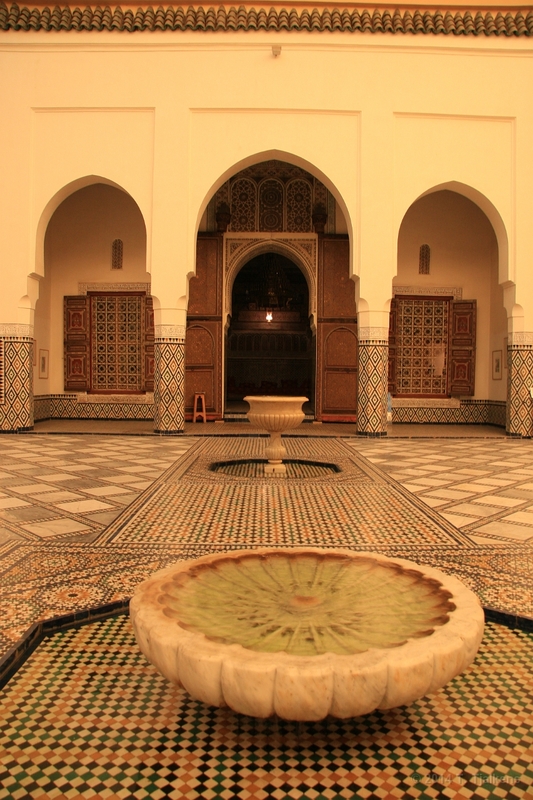 21 The museum is housed in the Dar Menebhi Palace, built at the end of the 19th century by legendary Mehdi Menebhi. 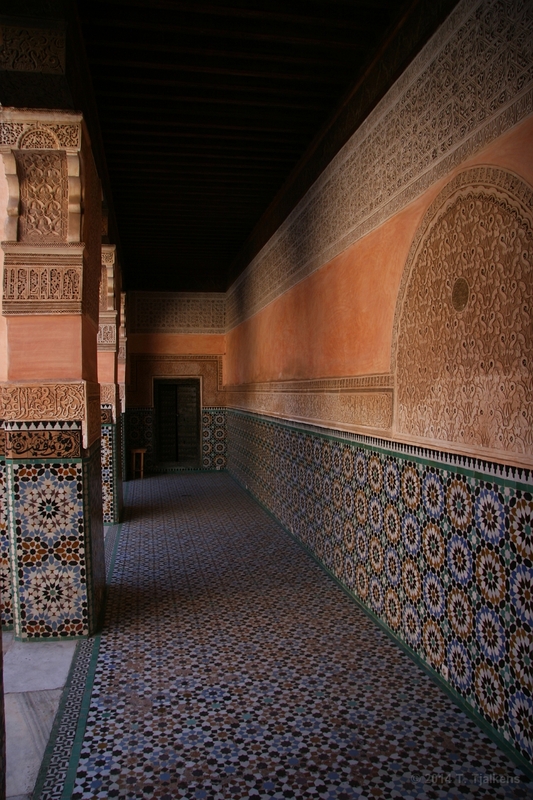 The palace was carefully restored by the Omar Benjelloun Foundation and converted into a museum in 1997. 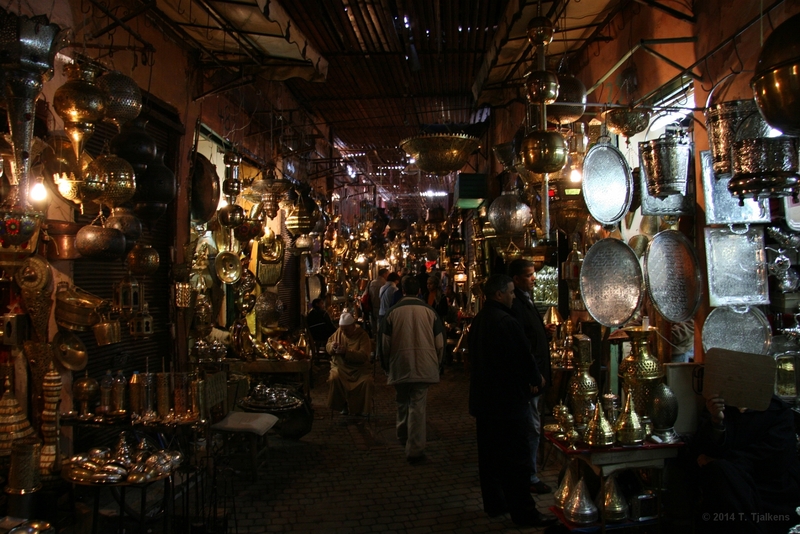 22 Copper and brass souk where you can buy all different metal items, from swords to lamps. 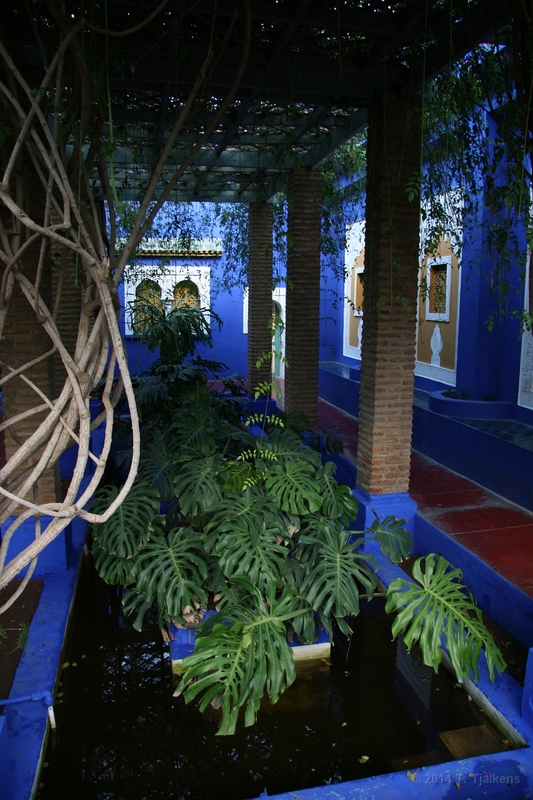 Walking around here is like walking in the tale of 1001 nights.